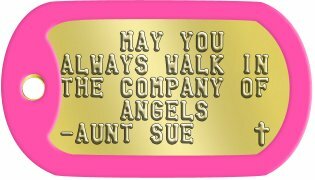 Spread the Good News with dog tags displaying an inspirational message. 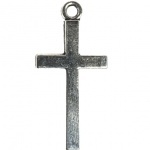 Whether you wear the dog tags around your neck, on a bracelet, or use them on a keychain, adding a beautiful, thought-provoking message can remind you of your faith in Jesus Christ and perhaps motivate others. 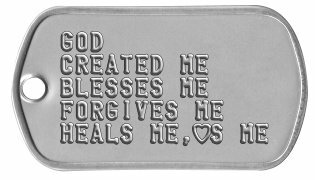 See more details about our Inspirational Christian Dog Tags or Customize yours now! 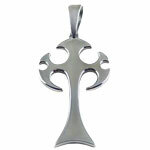 The cross is such a powerful symbol that some people want to personalize a dog tag with only that image. 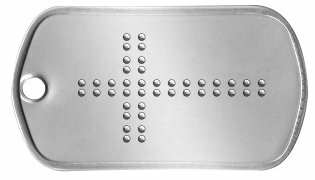 Create a dot matrix image of a cross embossed on a dog tag or use our special cross ✝ symbol. 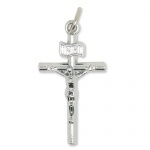 See more details about our Crucifix Dog Tags or Customize yours now! 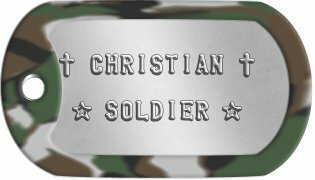 See more details about our Christian Soldier Dog Tags or Customize yours now! 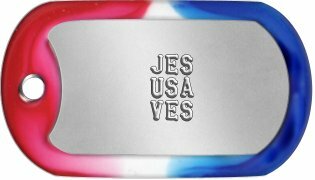 We have a fun and patriotic play on the phrase "Jesus Saves" as another idea for what to include on your Christian dog tags. 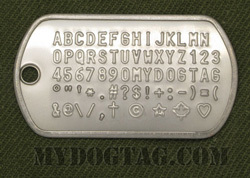 Space out the words and lettering across three lines so you include the word "USA" on your dog tag. Add a red, white, and blue silencer to perfect your patriotic religious dog tag. God Bless America! 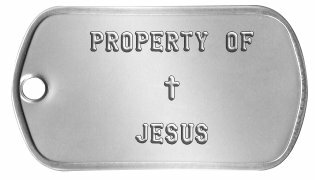 See more details about our Jesus Saves Dog Tags or Customize yours now! 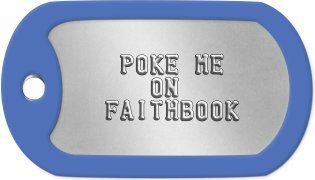 Want to connect your faith and your Facebook page? Then you should include a social media message on your dog tags! 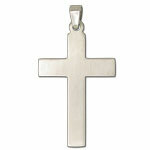 This way, you can spread the Gospel -- both on the Internet and around your neck! 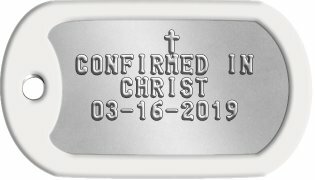 See more details about our Connected Christian Dog Tags or Customize yours now! 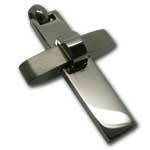 See more details about our Communion Dog Tags or Customize yours now! 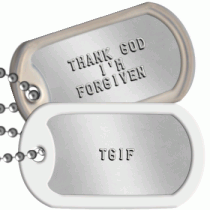 See more details about our Confirmation Dog Tags or Customize yours now! If you are a youth group leader, consider taking advantage of our bulk pricing to order dog tags for your entire youth group. 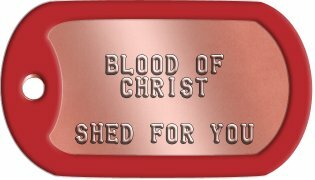 Present a set of dog tags to each child in your youth group so he or she can be reminded of their faith journey beyond just the time in your group. 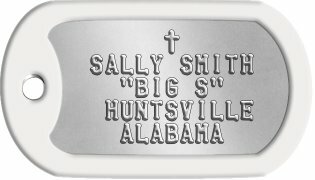 Customize dog tags for each child or add the name of your church or organization. See more details about our Youth Group Dog Tags or Customize yours now! Many churches and other religious organizations often organize various types of marriage encounters or retreats. These retreats are designed to improve communication between spouses, to deepen faith as a couple, and to help couples learn more about each other and work through any issues they may be having. 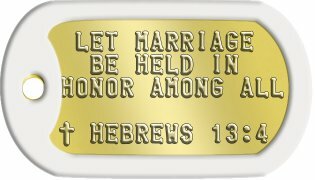 See more details about our Marriage Encounter / Retreat Dog Tags or Customize yours now! 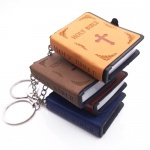 Keep your favorite Bible verse or passage close to your heart wherever you go. Write the entire verse or just note the book, chapter and verse. 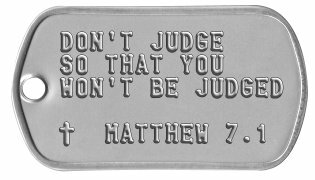 See more details about our Bible Verse Dog Tags or Customize yours now! 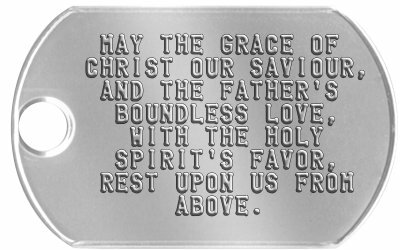 See more details about our Prayer Dog Tags or Customize yours now! There are so many different types of Bible study groups -- in person, online, men's, women's, singles, family, and more. As a member of a Bible study group, it's nice to know you are not alone as you work to deepen your faith. 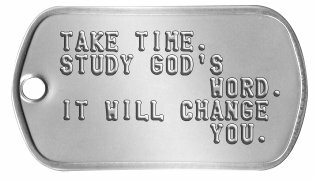 See more details about our Bible Study Dog Tags or Customize yours now! CYO stands for Catholic Youth Organization, and it was started in 1930 in Chicago. Today, many Catholic youth are part of sports teams through their churches and CYO including football, basketball, track and field, volleyball, boxing, and more. 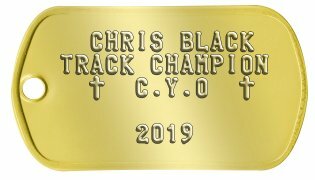 See more details about our CYO Dog Tags or Customize yours now! All orders are shipped within 1 business day and are usually delivered within 1 week (in North America). If you need any assistance creating or ordering your Christian Dog Tags please contact us directly, we are here to help!